With the ability to play a vital role in the growth of your business, it is imperative that you hire only the best. 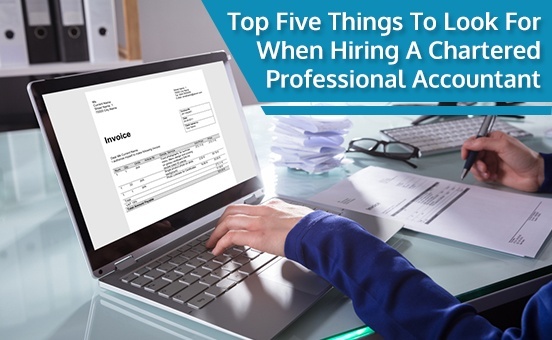 To help you ensure that you are getting the best, here are five aspects to look for in a Chartered Professional Accountant that you are considering. Hire a true professional CPA who is well trained and skilled and does their work skillfully with effectiveness and seriousness of manner. It is best to hire a CPA recommended by family or friends, if not do read their online reviews before hiring. Bookkeeping is the foundation of accounting. Make sure your CPA offers bookkeeping services to generate an accurate flow of high-quality accounting information to feed the financial statement reporting and year-end tax advisory process. A CPA is not just responsible for all your accounting needs but is also the one who can help you build your business or get you out of a financial mess with their knowledge and wisdom. As they play such a vital role in achieving your goals, it is crucial that you hire a trustworthy CPA. Get references and speak to past clients about their experiences to gauge if they can be trusted with all your confidential accounts. Apart from just managing your finances, an accountant should be able to help you improve cash flow management, enhance business growth and work within a strapped budget. They must look into all the minute details that can help your business grow. Every accountant goes through a lot of documents, both in physical and in digital format. The sheer volume of files, documents and archives are so much that they will lose their way if they are not systematic. Therefore, it is of utmost importance for an accountant to be organized in their approach. If you are looking for the best chartered professional accountant in Calgary, AB, reach out to R Singh Professional Corporation. We take great pride in embracing industry best practices and providing the highest standards in client advisory to clients across Cochrane, Airdrie, Okotoks, North West Calgary, South West Calgary, South East Calgary, and Northeast Calgary. We help individuals, small businesses, and corporations manage their accounting requirements and achieve growth as your success is our success. With extensive experience in bookkeeping, financial reporting, and tax advisory we bring a commitment of technical expertise and relevant industry experience to every client engagement. Our priority is to provide you with accurate, timely numbers to assist in your business decision making.